(Newser) – Former CIA chief John Brennan is lashing back at President Trump after being stripped of his security clearance. Trump's denials of any collusion with the Russians during the 2016 election are "hogwash," Brennan writes in the New York Times. He uses the same word to describe Russia's denials of meddling in the election. In his op-ed, Brennan makes the case that a sophisticated Russian scheme sought to find "gullible or unprincipled individuals" who could be easily manipulated by "Russian puppet masters." And Trump, he suggests, became the perfect puppet. 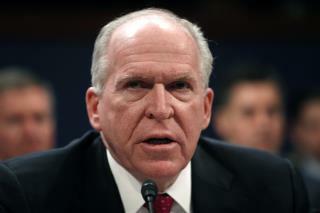 Brennan is the stuff for which hogwash is used. Putin the evil master is his boss. So obvious. Even them deplorable supporters of his know it too but they are just as bozo as he is.